Melissa was invited to participate as the Guest Artist at the March 2014 Stitches & Craft show here in Brisbane. The Show was a marvellous success. Due to an overwhelming request from show goers. Workshops and Beading Classes will be offered later in the year by Melissa. Please contact Melissa if you would like your name added to the class list. You can also check the status of my web page Workshops and Beading Classes. 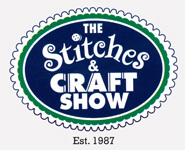 'The Stitches and Craft Show'.